2018 Hoover Angus Sale Report - Livestock Plus, Inc. The 90th Anniversary Hoover Angus Sale was held Tuesday, February 6, 2018 in Creston, IA. 175 lots grossed $926,400 to average $5294. Cattle sold to 16 states and Canada. 104 bulls averaged $5848. 72 yearling bulls averaged $6497 and 32 fall bulls averaged $4389. The highlight of the bull sale was 6 Hoover No Doubt sons averaging $11,750 and 18 yearling Baldridge 38 Special sons averaging $9806. 47 spring bred heifers averaged $5152 and 24 fall bred heifers averaged $3169. Top bull: Lot 21, Hoover 38 Special S4, sold 2/3 interest for $39,000 to Eagle Hill Farms, Lucas, IA. He is a 12-31-16 son of Baldridge 38 Special. Second top bull: Lot 47, Hoover No Doubt S34, sold 2/3 interest for $27,500 to Glen Hanson, Greenfield, IA. He is a 1-12-17 son of Hoover No Doubt. Third top bull: Lot 10, Hoover 38 Special S87 sold for $17,000 to Travis McGee, Columba, MO. He is a 2-5-17 son of Baldridge 38 Special. Fourth top bull: Lot 45, Hoover No Doubt S129, sold 2/3 interest for $14,000 to Miller Angus, Draper, SD. He is a 2-13-17 son of Hoover No Doubt. Fifth top bull: Lot 57, Hoover 38 Special S186 sold for $13,250 to Rolling 7 Ranch Co., Broken Bow, NE. He is a 2-18-17 son of Baldridge 38 Special. Sixth top bull: Lot 34, Hoover 38 Special S25 sold 2/3 interest for $12,000 to Carl Wibholm, Dows, IA. He is a 1-8-17 son of Baldridge 38 Special. Top bred heifer: Lot 109, Erica of Ellston R96 sold for $48,000 to Eagle Hill Farms, Lucas, IA. She is a 2-5-16 daughter of Bruns Top Cut 373 bred to Baldridge 38 Special. 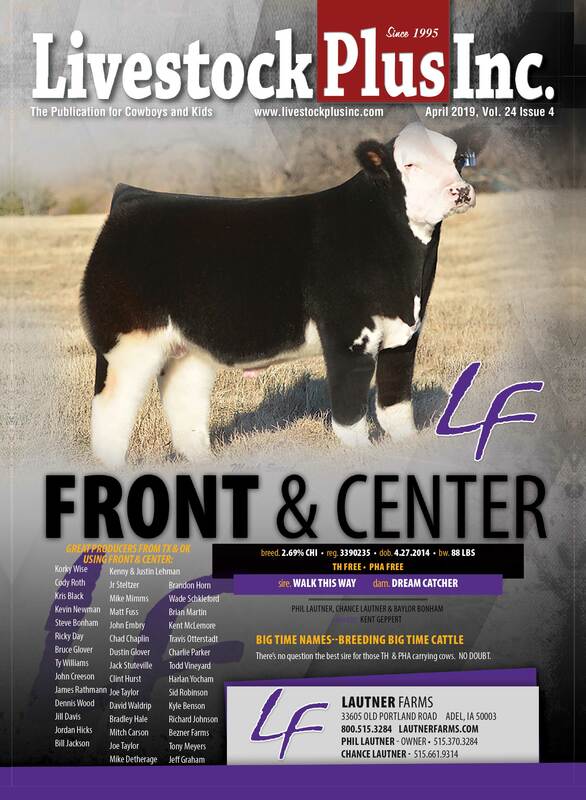 Second top bred heifer: Lot 110, Erica of Ellston R65 sold for $22,000 to Hansine Ranch Partnership, Pierre, SD and Moon Creek Farms, Rock Rapids, IA. She is a 1-26-16 daughter of Bruns Top Cut 373 bred to Baldridge 38 Special. Third top bred heifer: Lot 116, Gammer of Ellston R193 sold for $10,500 to Sydenstricker Genetics, Mexico, MO. She is a 2-17-16 daughter of S V F New Design T252 bred to Baldridge 38 Special.